I got into a debate about the Oxford comma on a New Yorker post on Facebook. I wouldn't be nearly so anti-OC if the OC partisans weren't so freaking smug, coming up with specious arguments like this one that keeps popping up on my Facebook feed about JFK, Stalin and strippers. The reason the Oxford comma is wrong is because when you join two words together by a conjunction ("and") you don't use a comma. As in: "We invited JFK and Stalin." NOT "We invited JFK, and Stalin." And it shouldn't matter how many items come before the items joined by a conjunction - the conjunction still doesn't get a comma. 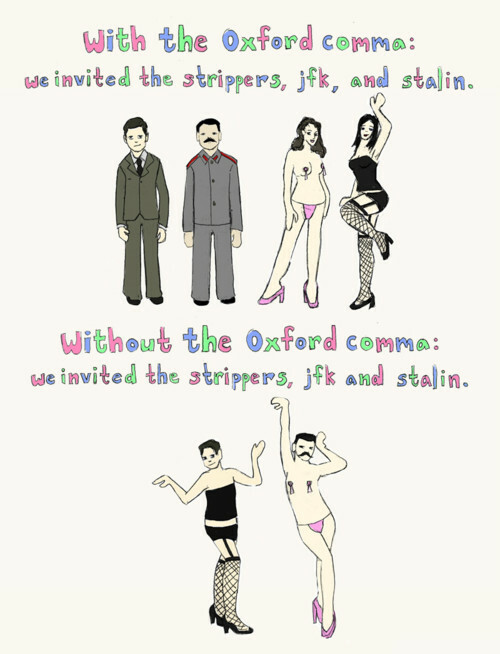 Now the reason that the sentence "We invited the strippers, JFK and Stalin." is confusing is not because of the lack of an Oxford comma, it's because a list of things has a unifying principle, otherwise why make it a list? JFK and Stalin are proper nouns, while strippers is not. Instead of depersonalizing the strippers by referring to them only by their occupation you could say: "We invited Candy, Trixie, JFK and Stalin." Or refer to them all by their occupations: "We invited two strippers and two heads of state." - No need for any commas. If the strippers were named JFK and Stalin you could say "We invited strippers JFK and Stalin." Again, no need for commas. We invited heads of states, Candy and Trixie. As strippers, Candy and Trixie are nobodies, so who cares what their names are? And that's why this list is wrong in the first place: a list of four people, two of whom are so much lower-status that they are not even referred to by name, grouped together with two world leaders. The Oxford comma is a crutch for those who are too lazy to write with clarity. It is entirely superfluous and needs to be dropped from proper English usage.